When the most valiant and wicked Asura, ‘Mahishasura’, was destroyed along with his ferocious army by the Goddess, the joy of the Gods knew no bounds! The hosts of gods headed by Indra lauded her, bowed down to the Devi and sang the ‘Devi Stuti’, in her praise & astound jubilation! The ‘Devi Stuti’ is the longest and most eloquent of the Devi Mahatmyam’s four hymns. It throws light on the concepts of good and evil, fate and free will & karma and divine grace. The hymn praises Durga as good fortune in the dwellings of the virtuous & misfortune in the abodes of the wicked. The ‘Devi Stuti’, implicitly points to an impersonal balancing principle at work in the universe - the law of karma. The hymn also says that the Mother’s intentions are most gracious even toward evildoers. Through her inconceivable race, even wrongdoers who have committed great evils get purified simply by being slain by the hands of the Devi. 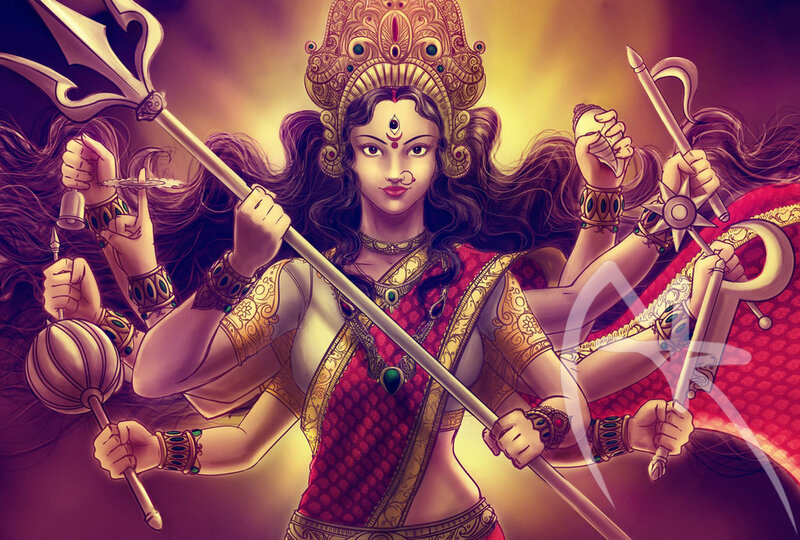 In destroying the demons the Goddess destroys the evil samskaras within us. The Devi, the care-taker & supporter of the three worlds is praised and worshipped with celestial flowers, perfumes, unguents and heavenly incense by the devas. The Devi is pleased & benignly serene in countenance she grants the Gods a boon. The Gods, who were overwhelmed with gratitude after the defeat of Mahishasura, needed nothing for themselves and only asked for the Devi to appear again to protect them from direct calamities whenever they called upon her in the future. They also prayed to the Devi to be gracious towards any mortal who sings the divine ‘Devi Stuti’ in her praise, and bless him to be fortunate. Goddess Bhadrakali who was thus propitiated by the gods for their own sake and that of the world, said “So Be It” and disappeared from their sight. Since time immemorial ‘The Devi Stuti’- of the Devi-Mahatmya in Markandeya-Purana, is recited during the nine days of Navratri, as a reminder of the Devi’s boon to the Gods. The Devi Stuti is also known as ‘Shakaradi Stuti’ (praise by Indra and the host of gods). Praising the Devi and seeking her blessings with this rendition is an essential part of the Navratri Puja.